Belgium is a key transit hub for northwest European natural gas flow, acting as a bridge between British and mainland European gas markets. This summer, Belgium is likely to export more natural gas than normal to the Netherlands and Germany, which could be supplied by greater imports via the bidirectional Britain-Belgium Interconnector pipeline. 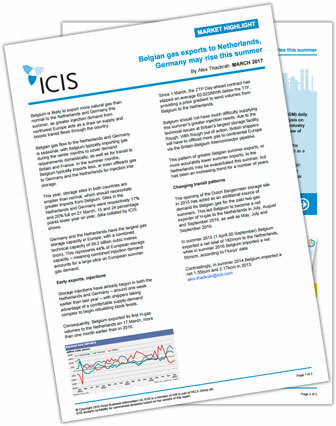 ICIS looks at the price spreads and fundamental factors which will drive these transit flows at the start of the gas summer, a time when storage injection demand typically ramps up across Europe.